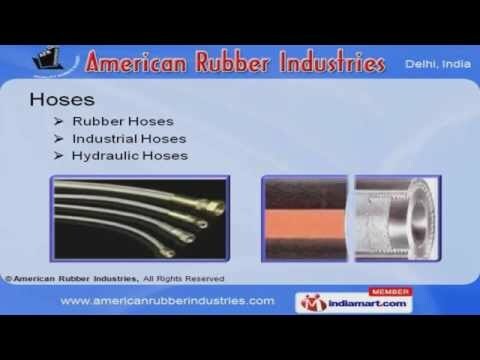 Welcome to American Rubber IndustriesManufacturer of Rubber ProductsWe are an ISO 9001:2000 & JAS-ANZ certified company, incorporated in the year 2009. We offer ISImarked product range across Indian Subcontinent. Our strength lies in infrastructural facilities, team of experts and consistent quality of products that weprovide to our customers. Hoses, Rubber Mouldings, Pneumatic Fittings & Cut Gasket are some of our products. We offer wide array of premium grade Hoses like Rubber, Industrial & Hydraulic Hoses. Our Industrial Seals, Gas Kits, Grommets, Silicon, Neoprene & Viton Rubber Sheets are one of the best inthe industry. We provide an exclusive range of Couplings & S. S. Bellows to our elite clients. Along with that we offer Cords, Rubber Tubes & Containers Seals under Rubber extruding. Our Water Stop Seals, PVC Handrails, CAF, Teflon & Cork Gaskets are fabricated from premium graderaw materials.